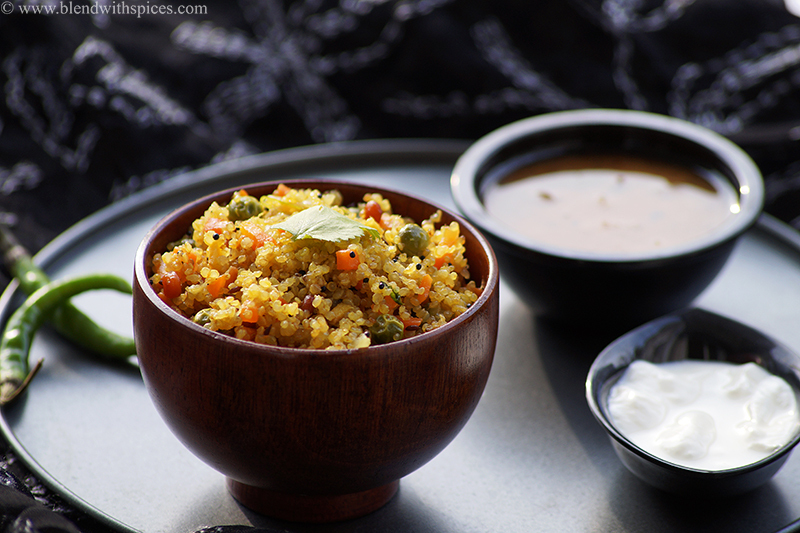 Quinoa Upma is a simple and healthy South Indian style breakfast dish. It is very easy to make and rich in protein and iron. 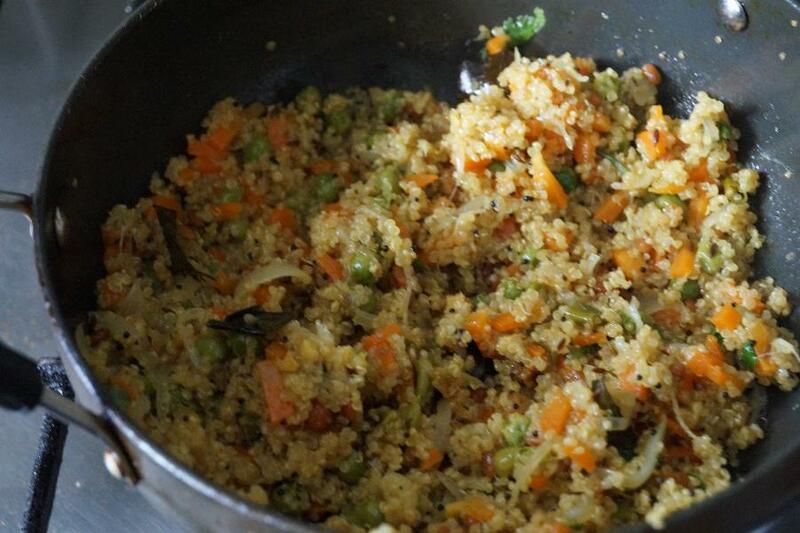 I have used carrots and peas to make this quinoa upma. You can use your favorite vegetables. If you are looking for more healthy breakfast recipes then do check Instant Ragi Idli, Banarasi Chura Matar, Ragi Semiya Upma, Godhuma Rava Undrallu and Methi Poha. 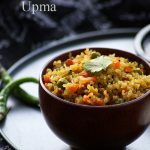 How to make South Indian style quinoa vegetable upma recipe. A healthy breakfast recipe with step by step photos and video. 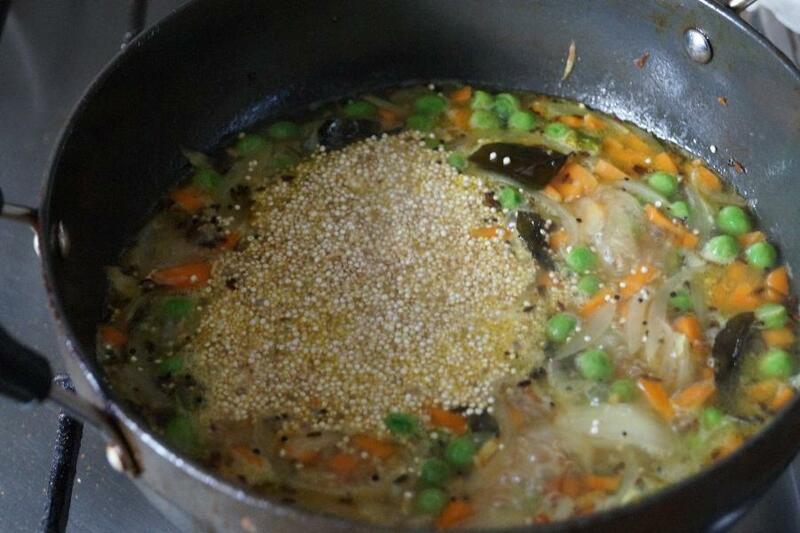 Heat oil in a pan and add the mustard seeds, cumin seeds, urad dal and chana dal. Fry until they are golden brown color. 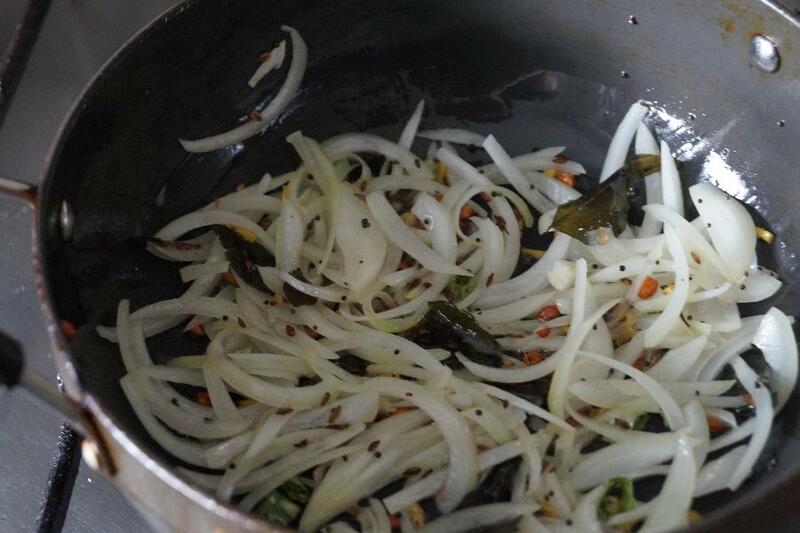 Then add the curry leaves, chopped ginger and chopped green chillies and saute for a min. Now add the sliced onion and fry until translucent. 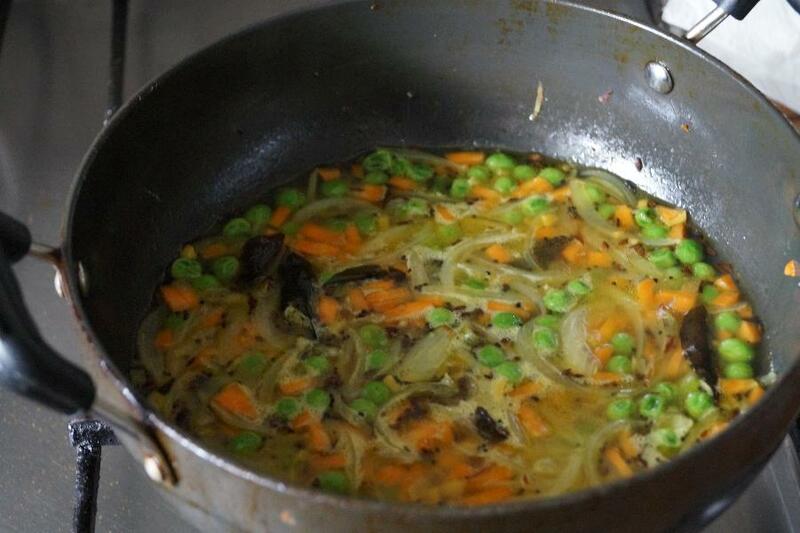 Add the chopped carrot, green peas and turmeric powder and saute for a minute. Add 1 1/4 cups of water and salt and bring it to a rolling boil. Now add the rinsed quinoa to the boiling water and mix well. Cover the pan with a lid and let it cook completely over a low-medium flame. Add the coriander leaves and serve hot with chutney or sambar. You can also serve with fresh yogurt or raita if you are not vegan. You can also add the peanuts or cashew nuts to the tempering. 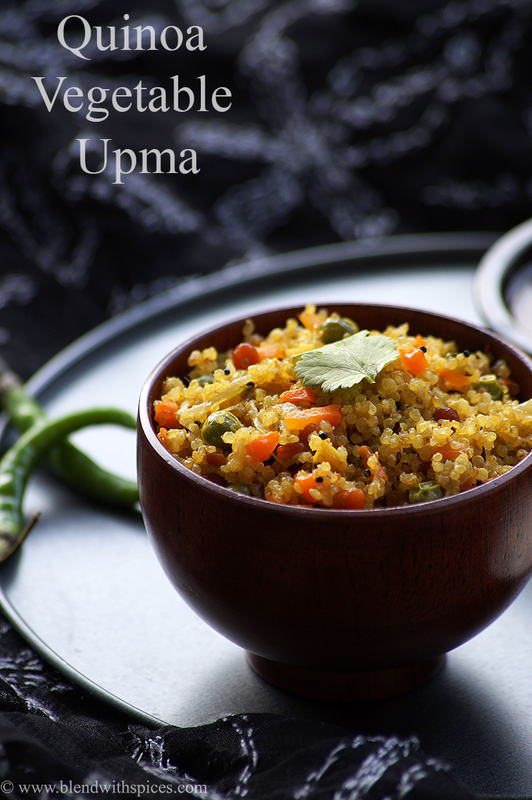 Use your favorite vegetables to make this upma. Heat 2 – 3 tablespoons oil in a heavy bottomed pan and add the mustard seeds, cumin seeds, urad dal and chana dal. Fry until they are golden brown color. Now add the sliced onion and fry until translucent and light brown color. When they are done, add the finely chopped carrot, green peas and turmeric powder and saute for a minute. Add 1 1/4 cups of water and salt to the seasoned ingredients and bring it to a rolling boil. Reduce the flame to low-medium. Cover the pan with a lid and cook completely. When it is soft and cooked, turn off the flame. Add the chopped coriander leaves and combine. Serve hot with chutney and sambar. You can also serve with yogurt if you are not vegan.